How is it to study Bocconi Msc Finance as an Indian student? I am an Indian student very interested in Bocconi Msc Finance. Could you please provide me an insider’s view of the job opportunities with this program in Milan, Italy? 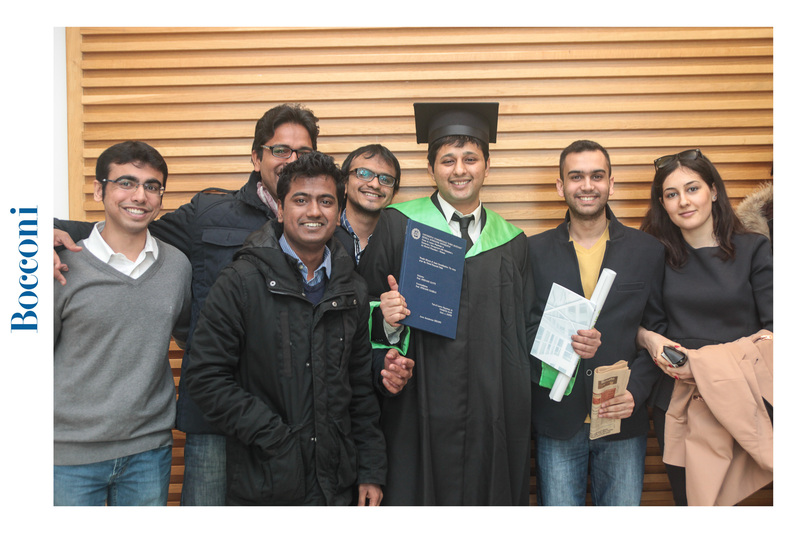 Is Bocconi Msc Finance worth the return on investment for an Indian in Europe ? How do I manage my student budget and expenses in Milan? What are the average requirements to get admitted in the program? My Bocconi Experience: Finance, Food and Fun! The Bocconi Msc Finance is very highly rated in Europe. I very much recommend it for an Indian student seeking to push himself out of his comfort zone, studying with the smartest European students, learning a new language and making new friends in a distant land. The course has been popular because it allows many graduates to also enter the London Financial Sector. I have done numerous interviews for positions in London. It is quite competitive as I remember having students from all over the world from top London schools interviewing me at the Investment Bank offices in Canary Wharf, London. Bocconi Msc Finance definitely gives you several big opportunities. If it can land you in the same room with the brightest students from University College London, Imperial College London, London School of Economics and Political Science, Warwick etc. To convince someone to hire an Indian in Europe for a non tech job can be challenging if you lack enough experience even living in the continent. The two year Master’s program is perfect for graduates of non economics backgrounds to study Finance. As a former Engineer myself, I found Bocconi University to be a great place to learn a lot inside and outside the classrooms. As it was a two year program, there was more time to absorb learnings and also have a little fun. I had to complete over 14 mandatory Finance courses along with 2 language courses,an Internship and Thesis to graduate. With 10 challenging compulsory courses in the first year, there is a choice for the 4 electives to be selected the next year. Honestly, if you want to work in Europe, you should be more familiar with the Europeans. As an Indian in Europe, Communication really changes as you meet more people. Hence, life in Bocconi has it’s fair share of fun and parties which play an important part in business education. The course structure is very flexible and many students (even me) skip a semester to finish an internship if required. Most others would finish the internship in the summer itself. But it can be challenging to finish all your 10 finance courses and also find your internship to start by summer. Making it worse is an Indian student’s difficulty in making a visa to visit London from Milan just for the interviews. Nonetheless, if you work hard and keep applying you should get called by some prestigious firms. Cracking the interview and getting the job can be challenging and you will have to prove yourself to be the best for the job. Lots of training required, but two years is a long time and you will be finding more time in the second year with fewer exams left. While attendance may not be mandatory, the Professors also provide regular meeting hours outside class hours to clarify student doubts. The Msc Finance program at Bocconi University is very quantitative and might also make engineers sweat. You usually have group projects in certain subjects like Corporate Finance, Financial Statement Analysis, Financial Law, Theory of Finance etc where you get to work on really fun and challenging tasks in international teams. Though a class of around 60-70 students may have around 30% internationals, there are also exchange students who join in. As an Indian in Europe, you usually don’t meet many other Indians like how you would in the United States or even in the UK. But nearby to Milan, the Brescia and Bergamo region have had a steady influx of Indians mainly from the Punjab region. If you can drive around, you could even have chai in a cafeteria in this street near via Milano in Brescia. Largely inhabited by the Indian community there are sweet shops, cloth shops and you could even watch a Cricket Match and munch on samosas in this strangely comfortable cosy Indian cafeteria. What are the Job opportunities after studying in a top Italian university like Bocconi? I had arrived early in Milan to attend the preparatory courses for two weeks before the actual classes began. One of our senior Professors had some useful advice to us uninformed students. He had asked us to apply for the internship programs at the London banks as soon as possible. His words were that if you apply this year you will seem more confident. If you do the next year, you may be less desired. He was quite right about it. So I had barely began my course and was expected to have my resume prepared and sent around while I also prepare for a challenging first semester. Life in Bocconi: The good times! Classes begun in September and we had our first semester exams in January and February. Lot of these Investment Banks would be interviewing students right before or around the exam time. So basically, you not only have to study for your exams but you also have to spend extensive time in the internship application process. Application for internships and jobs online in the website of the these banks can take quite some time and energy. You usually have to answer some questions and even do some simple online tests. Not every Bank has the same selection criteria. I have done interviews with American Banks like Morgan Stanley, J P Morgan and Bank Of America as well as European banks like Unicredit, Intesa Sanpaolo and BNP Paribas. I did Phone Interviews, Assessment Centers and a lot of other rounds in the entire rigorous ordeal. Though, I was prepared well with all the Finance stuff, client facing banking jobs have challenging interviews. They usually stress on lots of things like teamwork, structure of answers, extracurricular activities etc. Unfortunately, I believe I lacked enough experience and confidence when I did those interviews. I did not speak much Italian during that time and was still familiarizing myself with European culture. By speaking only English and other non European languages, you already have a small disadvantage. Complemented by your lack of work permit there are a few obstacles to be faced. I was also not very confident of doing interviews in Canary Wharf while I visited London for the very first time in my life. However, I learned from the experience. I did a wonderful Research Internship with the Chief Economist of the Dubai International Financial Center, worked as an analyst in the Investments & Retirement Division at Mercer Consulting, Milan and finally worked as a Consultant / Territory Sales Executive with Western Union Italy. On my last day of work at Western Union, I was interviewing a final round Interview with a major Investment Bank. A lot had changed in the Investment bank interview then and now. Firstly, the location away from London. Secondly, the salaries offered to young analysts became less attractive. Thirdly, the increasing demand for technology professionals for many Investment Banking positions. How does Bocconi actually help you with your career? The opportunities at DIFC and Mercer were through the university job portals. Bocconi has a job portal with interesting positions around the world published regularly. Moreover, Bocconi has several internship programs at prestigious organizations like the UN etc which can be a wonderful launching pad for your career although they may be unpaid. I will recommend Bocconi as a wonderful investment as it really opens a lot of doors for you. But after all, you can bring the horse to the water but you cannot make the horse drink the water. Apart from the Finance program, there are students doing the International management, Marketing, Innovation & technology management etc. The university also has a Business school called SDA Bocconi which has 1 year MBA programs for more experienced students. The benefit of this is that you have Professors from the SDA Bocconi school also teaching courses for the Msc finance students. I remember a lot of really cool Professors at Bocconi. This one day, we went to the computer lab to play a trading game. The entire lab became like a trading floor as we made option strategies in teams. That was definitely one of the best Finance classes we had at Bocconi. Finding a part time job in Milan can be challenging for Indian students. A few Indians I knew did some freelance projects in IT to make extra money. Without speaking Italian it would be difficult to do other small time jobs. Fortunately, Bocconi offers several scholarships which have reduced in amount in the past few years. Nonetheless, getting these scholarships would make study in Boconi a very value for money deal. There are Merit based scholarships as well as need based ones. If you can submit a top application early to Bocconi and are successful you may have a higher chance to avail the Merit based scholarship. The Need based scholarships on the other hand require documentation on family income, assets etc which need to be translated in Italian. Check for ISU Bocconi scholarship. If you receive this, you may even be offered a room to stay in of the dormitories at a highly subsidized price. Alternatively, Bocconi offers subsidized meals etc in the wonderful canteens within the campus. As a Business University, the university campus is just a few buildings within the city. The dormitories are also located near by. Even the Duomo is just 15 minutes away by walk. Housing: 300-400 € for a shared room, 400-500+ for a single room. You may find better deals. Even the student dorm room could be available in the 300 € range. Which makes it a real great deal to choose the dorms if you qualify for subsidized rates. Groceries: 200 € a month should cover basic super market expenses. Hence, monthly expenses are in the range of 700-900 € for most Indian students. To get admitted in Bocconi Msc Finance, you would need a GMAT of around 700. Moreover a very strong application with a cover letter, CV, certificates etc is very important. I know people admitted even with lesser GMAT, but the guys with the Merit Scholarships had high GMAT scores. It is very important to make some solid planning so that you make the best of your studies here. A friend of mine who arrived with me had his eyes set on Germany very early. He has been working there for several years now with big corporates. One more friend worked with Vodafone India, so could easily get a job in Vodafone Italy. He has been working with Vodafone ever since. Generalist or Specialist: career tips? Sticking to one job can be very useful in your European career. Though everyone likes a generalist like me ( Mechanical Engineer- Economic Research- Investment Consulting- Financial Services Sales- Blogging & Web Development), they would always prefer an expert with multiple years of work experience for an important job. Being a generalist may help you get admitted in Bocconi, but everything else is up to you from there. Next PostNext Stock Trading Ideas for Dummies: How to Invest like a Pro?